Drobpox just put online a new beta version of its application for Android. Stamped 2.2.2.8, this version is heavily loaded with photos you can finally create albums within your directory " Camera upload " . Other minor improvements are also in the game. For several months now, Dropbox has incorporated a feature quite interesting, and recently put forward by SFR : automatic upload of your photos. Via a new version of its Android client beta, the company has to improve by adding (finally) the ability to create albums to sort and consolidate some of your shots. Note that this does not add folder in the folder "Camera upload" your account, and it is only album "virtual". For the moment, they are only visible from the beta version of Dropbox for Android, but we bet they will soon since other applications. In addition, you can share an album with your contacts, either via a link or via social networks for example, which should appeal to some. 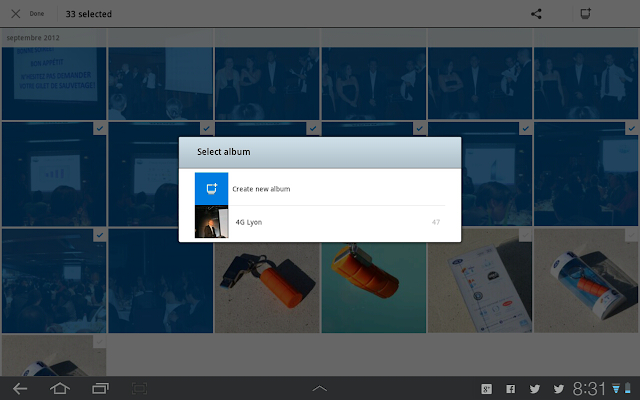 Also note that it is now possible to select multiple photos for deletion of a sudden, that was not the case before. As always, Dropbox clarifies that other minor changes and bug fixes are part of, and a new option appeared in the parameters: " Get early releases "which is enabled by default in the beta. It allows you to automatically receive all future updates to the application, whether those of the forum or Google Play Store. A dedicated topic is also available on the side of the brand. To download this version of Dropbox for Android 2.2.2.8 you can track via this link, or the QR Code below. In both cases, be sure to allow unknown sources in application settings in order to install it.